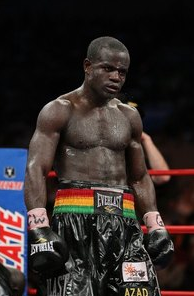 Joshua Clottey will be Manny Pacquiao's next opponent on March 13th. Top Rank Promotions has just announced on its Facebook page that Manny Pacquiao will fight top welterweight Joshua Clottey on March 13. The announcement comes in the aftermath of the collapse of the mediation efforts by former Judge Daniel Weinstein to achieve an agreement between the camps of Pacquiao and Floyd Mayweather Jr for a Pacquaio-Mayweather megafight that would have been the highest grossing bout of all time. The mediation efforts ended without success when, reportedly, Pacquiao agreed to unlimited urine testing and blood testing up until 24 days before the fight, and immediately afterwards. Mayweather reportedly was willing to allow a cutoff 14 days before the fight. I experimented with taking a look at your blog on my new iphone 4 and the format doesnt seem to be right. Might wanna check it out on WAP as well as it seems most cellular phone layouts are not working with your website.